We are pleased to announce the first ever annual quilt retreat on our beautiful mountain this summer. 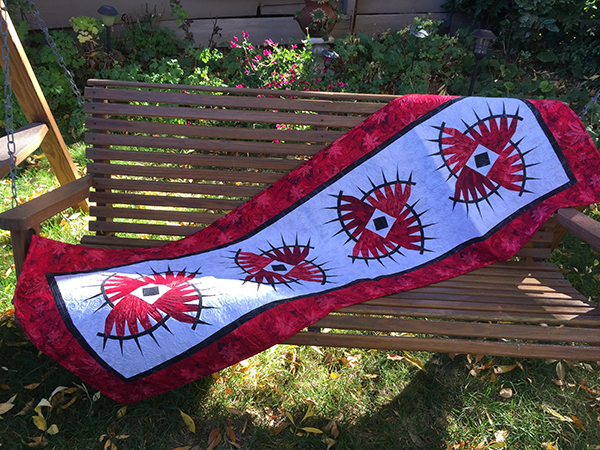 The "Sunrise Quilters on the Tavaputs" will be held July 19, 20, and 21 with certified Judy Niemeyer instructor Karen Caduff of Salt Lake City, Utah. She will be teaching us the Rocky Mountain Bear Claw table runner and pillow combination. The deadline to secure a limited spot for this class is June 1st. Price of $565.00 includes transportation, lodging, all meals, a pre-cut kit, guided ranch tour and a new star-gazing event, plus much more! A $200 deposit is required to reserve your spot, so don't delay! Mail your payment to Tavaputs Ranch, PO Box 1736, Price, Utah 84501. You may also contact Charlotte MacKnight, sewcharlotte@hotmail.com or Karen Caduff, kcaduff@comcast.net for more information or with any questions.